The following assets have been made available for the NC State community's use in the run-up to our first Day of Giving. These assets are only to be used for official Day of Giving communications. 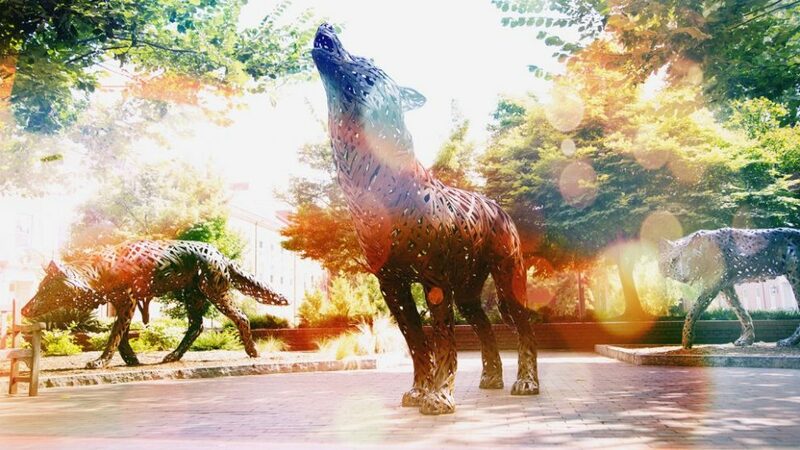 Make sure you are familiar with the NC State brand before creating any Day of Giving communications. 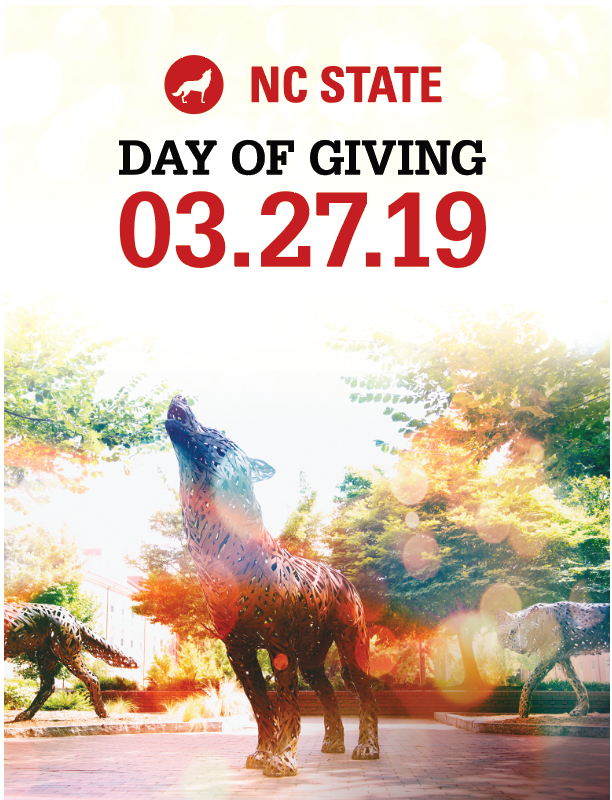 Rather than a single logo, NC State Day of Giving is represented by a combination of elements: the NC State logo, the campaign wolf logo, the date and the name of the day. A combination of these elements — assembled with careful attention to spacing and alignment — is called a “lock-up.” A lock-up should be selected based on the elements it contains and the layout in which it appears. Lock-ups can be fluid in how the elements are combined; you’ll find some pre-configured versions below. The large name version of the lock-up is the primary mark for the Day of Giving and should be used whenever possible. The large date version of the Day of Giving lock-up should be used when you want to emphasize the date of the event. The horizontal version of the Day of Giving lock-up should be used in cases where a horizontal orientation would better suit your design. 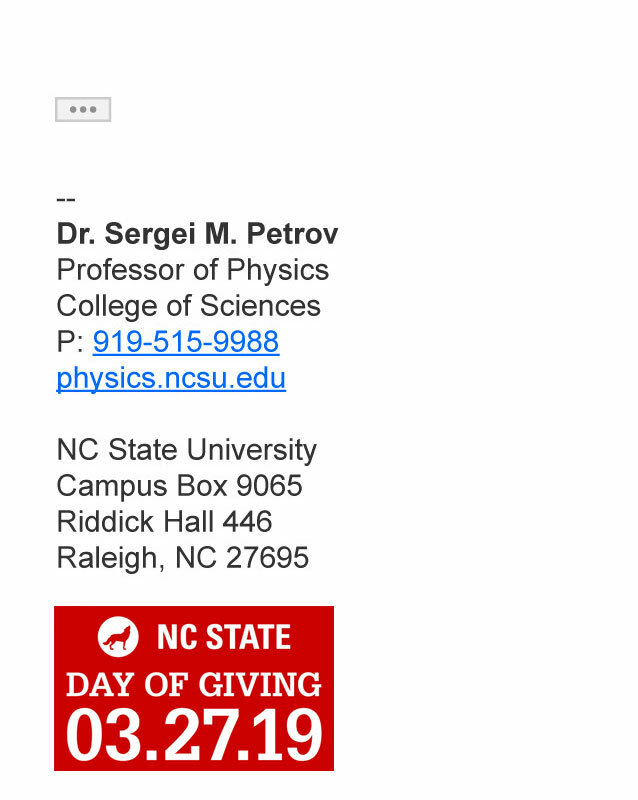 The name-only version of the Day of Giving lock-up lacks any NC State branding. It should only be used in coordination with another lock-up such as the NC State logo, a college lock-up or the campaign lock-up. This name-only lock-up should never be used as a stand-alone lock-up. See guidelines below for usage specifics. The no-date version of the Day of Giving lock-up should only be used on the actual Day of Giving. On this day, spotlighting the date will no longer be a priority and it can be dropped. Because your communications will likely include other logo elements — including campaign branding — the introduction of Day of Giving lock-ups could pose a design challenge. Keep the following guidelines in mind when selecting a lock-up for use, and remember that clarity and simplicity are paramount. Don’t group the lock-ups together: this much wording in a logo format is overwhelming. Mention the campaign in content, or place a campaign lock-up in a complementary place in the layout. Don’t duplicate the campaign wolf logo. Use a single wolf locked-up with either the Day of Giving or campaign type. Don’t group logos and lock-ups together: this much wording in a logo format is overwhelming. Place them in complementary places in the layout. This document outlines the central email strategy for Day of Giving. Guidelines and content samples are provided for those colleges and units wanting to amplify the central strategy with additional messaging. 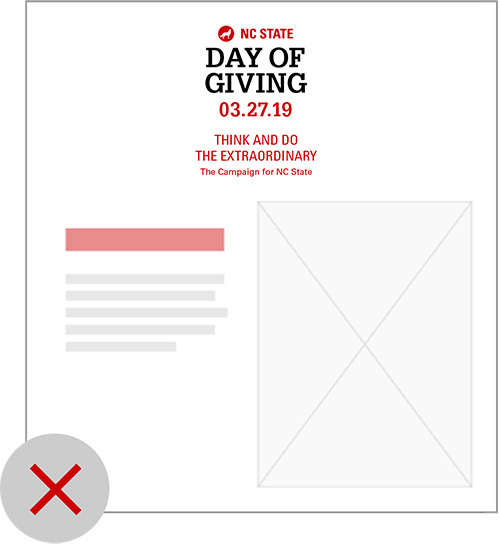 These print assets have been made available for departments and units for direct mail and print promotions of Day of Giving. Post the flyer on bulletin boards around your department or unit offices to help spread awareness of Day of Giving. The postcard can be printed and distributed to increase awareness and encourage support for Day of Giving. 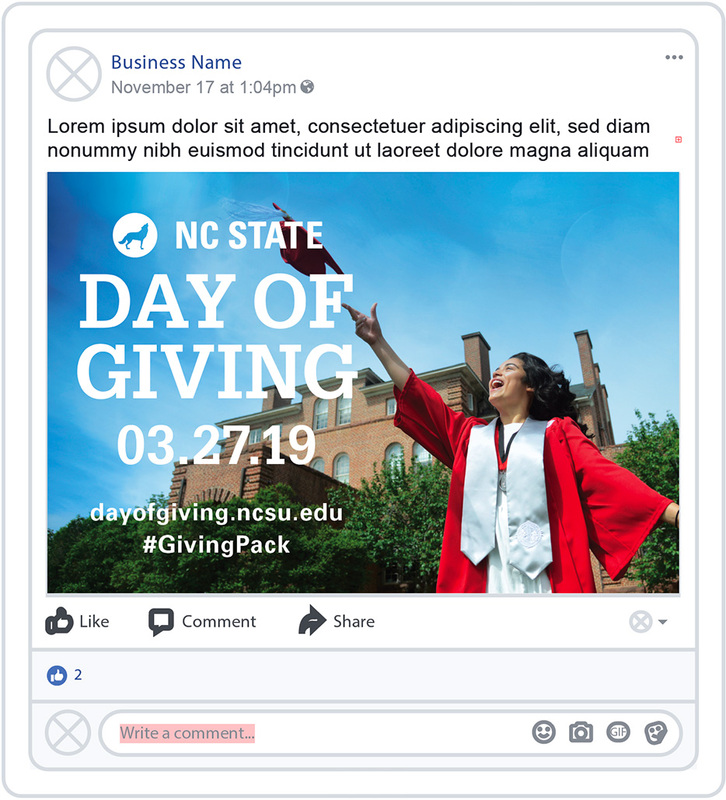 The social media toolkit includes a profile picture frame and cover art so you can easily add Day of Giving flair to your social media accounts. 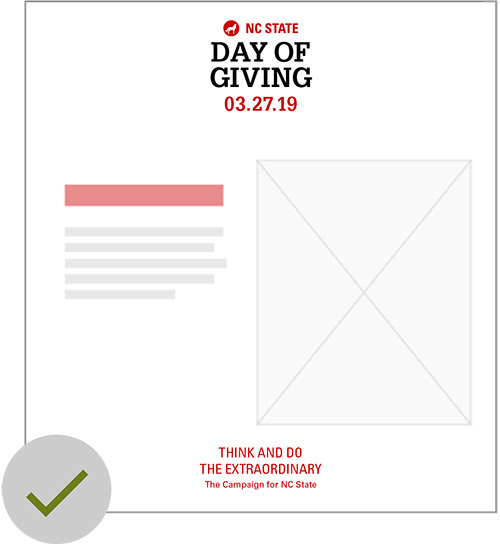 The sample content calendar provides guidance for social media messaging leading up to and on NC State Day of Giving. Keep an eye out for a social media toolkit for ambassadors, coming soon. The Social Media Ambassador Toolkit will include a Day of Giving frame that users can add to their Facebook profile picture. Facebook does not allow pages to natively add a frame to their profile photos. For this reason, we will provide a Photoshop file of the frame so colleges and units can add the frame via Photoshop and use their new profile photo across multiple social media platforms. Download the cover video of your choice to use on your Facebook Page. Download the cover photo of your choice to use on your Twitter account. Use this social media content calendar as a guide to plan your messaging leading up to and on Day of Giving. The key messages for NC State Day of Giving focus on the strength of the Pack, the extraordinary things we can accomplish together, the collective positive impact of gifts of all sizes and the ways each and every college, unit and program combine to make this university a force for good, not just in North Carolina but throughout the world. This document summarizes information specific to Development Officers. Learn how to steward VIP gifts, counting rules for VIP gifts, how to get VIP gifts into the leaderboard on Day of Giving and more. 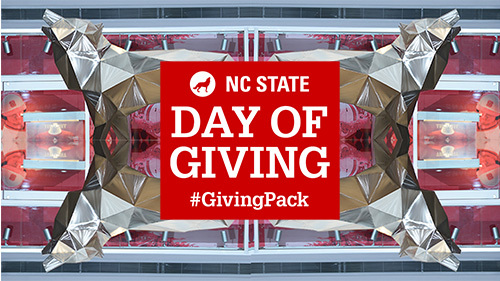 Challenges are a way to incentive donors and encourage engagement in NC State’s Day of Giving. This document summarizes the rules for counting various types of gifts in Day of Giving totals and outlines the criteria major gifts must meet in order to be included. 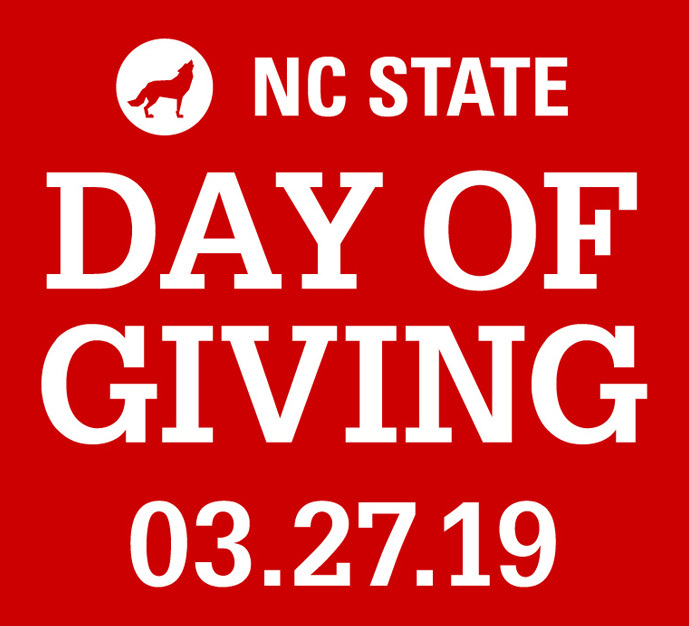 During the month prior to NC State Day of Giving, help spread the word by updating your email signature to include the Day of Giving lockup, which will link to dayofgiving.ncsu.edu. The lockup should appear on its own line at the bottom of the email signature — below all contact information, which should remain as text. Open your email settings (Gmail) in another tab or window, scroll down to the “Signature” section and enter your signature text in the text field. If you already have an email signature, verify that the information in it is correct. To properly format your signature text, use your mouse to select it all, and then use the formatting buttons directly above the text field to select the Sans Serif font at normal size. To insert the lockup, add two paragraph returns below the last line of text in your signature. Then, click on the below image, hold your mouse button down, drag the image into your email signature and drop it in the appropriate location. Once the lockup image is in place, click Save Changes at the bottom of the page. Download the lockup to your computer (below). In your email settings (Gmail), scroll down to the “Signature” section and enter your signature text in the text field. If you already have an email signature, verify that the information in it is correct. To insert the lockup, add two paragraph returns below the last line of text in your signature. Then click the Insert Image icon (next to the Link icon) and upload the image file from your computer. Go to email settings (Gmail). The following .PSD file can be edited and used to populate 16x9 ratio images for your website. These images can be used on your site to help promote Day of Giving. This letter can be used and customized by board members or other volunteers to reach out to their peers to share details about Day of Giving and encourage participation. This document provides helpful links and serves as comprehensive guide to soliciting and documenting gifts during the Day of Giving VIP Phase. Download the video file below and upload it natively to your college, program or fund's Facebook Page on or after Wednesday, March 13. Your Facebook post copy should encourage your Facebook Fans to share the original post from your page. 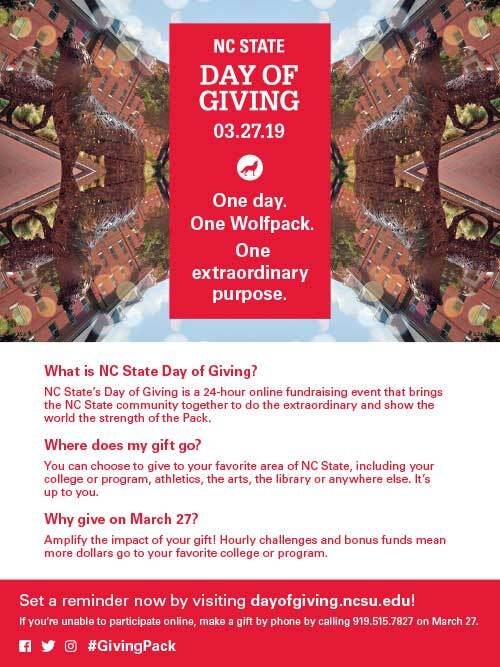 Example post: "Want to help us get an early lead on the NC State Day of Giving leaderboard? All you have to do is share this #GivingPack video! The college, unit or fund with the most shares by March 27 wins an extra $5,000. 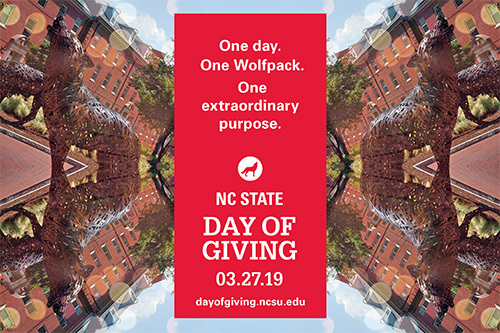 https://dayofgiving.ncsu.edu" Please note that this challenge is only on Facebook.